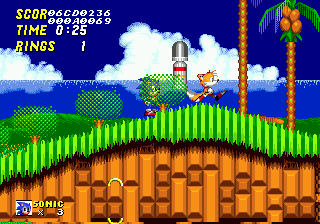 The level select for this zone claims it is called 'Green Hill Zone', but in the final it is given it's correct title as Emerald Hill Zone. The one main difference with this level is the inclusion of this weird new enemy, the Snailbot! 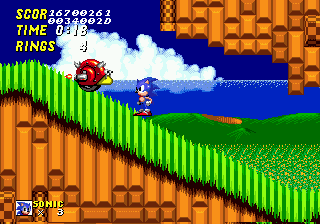 It's a one-up remake of moto-bug in Sonic 1, and will actually charge at you if you are in its sight. Most of the level work is completed for this level, but there are some blocked passages like this one. In the final there is a monitor in yoiur way which you can get through, but in the Beta it's just blocked off for no particular reason. If you search through the Debug mode you can come across this futuristic sign post, which is very different to the final. It will blink when you go past it and make the same noise. 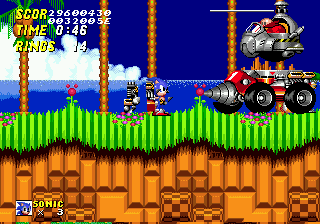 when facing Eggman in your first battle, Eggman will come directly downwards into his craft, then begin moving. In the final he comes down diagonally to join the two. 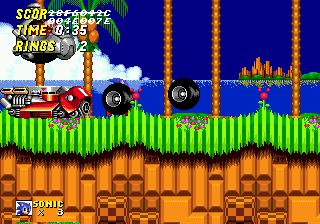 When Eggman is destroyed the leftover waste doesn't explode, it just sits there, and Eggman doesn't become burnt. 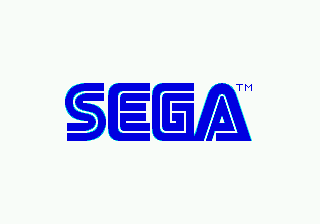 After the level is over, the missing SEGA logo pops up. It was thought to have been missing since it doesn't appear at the beginning, but it's there. 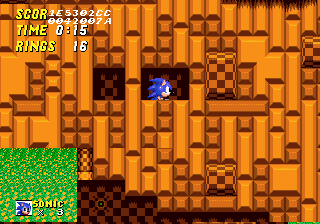 It's actually the one from Sonic 1 with a quick flash before the full logo, unlike the final Sonic 2 one where Sonic goes left to right.